Right now, the month is August, summer is nearing its end, and the Fall will soon be upon us. For most people, this means soon there will be cooler temperatures and less money spent on running the air conditioning. For others though, the coming of Fall means only one thing, some of the best hunting seasons will be opening soon and it’s time to get prepared! Although the dog days of summer may seem to stretch on forever, and yes it’s true that more than one type of game is available in the summer, along with the deer and turkey seasons that come with fall, the cooler temperatures and drier weather mean hunting will be a heck of lot more enjoyable no matter what your game of choice is. For many of us, Fall hunting is more about the pleasant conditions allowing for a more enjoyable hunt. For these folks, it’s not about waiting for a certain game season, but getting out when the temperatures are below scorching and the mosquitoes have packed it in for the time being. Let’s face it, as enjoyable as hunting is, it doesn’t take long for high summer heat and hordes of hungry bugs to put a damper on things. Still, others among us have no problem with summer conditions and would hunt even if the top blew off the thermometer if something worthwhile was in season. For these folks, Fall is the biggest and best hunting opportunity of the year since Deer, Turkey and other favorites come into season and any chance to get a jump on things is welcome. One way for hunters to get themselves primed for their favorite game season is to spend some time night hunting for varmint, predator and nuisance species. Getting out at night lets you avoid the full summer heat of the day, and going after these less desirable species allows you to hone skills and tactics that may have gathered a bit of rust in the off season. Not to mention, for the impatient types, night hunting in late summer provides an opportunity to work off a little bit of that impatience with some honest to goodness sport. Regardless of where you fit in, night hunting holds a lot of advantages that simply aren’t present during daylight hours. Predator and varmint species tend to be more active at night, there is less pressure on a given area from other hunters, and perhaps best of all, astute and observant hunters will seize hold of the opportunity to make note of how their favorite out of season species are behaving for future reference when their seasons open up. Perhaps best of all, night hunting, particularly with spotlights, is entirely legal in many states when it comes to nuisance, predator and varmint species. Obviously, one of the first things needed is to make sure that night hunting is indeed legal in your area. Despite what you may hear commonly thrown around, the rules vary widely from state to state, so checking with the local authorities is your best bet. Next up is to make sure you have equipment that can stand up to the requirements of night hunting and won’t end your outings on an early and sour note. Since most preparation for a night hunt is little different than any other type of hunting, the focus is on the special requirements of night hunting. Most notable for night hunting, a source of portable illumination is one of the first things to acquire. Although some believe just about any spotlight from the hardware rack at the local big box store will do, this is hardly the case. As with any other type of hunting, if you’re to be successful, equipment should be chosen with care a forethought. Hunting spotlights run the gamut from small weapon mounted lights to full on giant spotlights that have to be connected to a vehicle battery in order to be effective. For most purposes, a happy medium is more appropriate, and anything else overkill. A rechargeable handheld spotlight is usually the light of choice for most predator and nuisance game hunters. Fairly compact, requiring no external power source, and powerful enough to throw a beam at least 5oo feet, a portable spotlight can fill most hunting roles if properly selected. When looking for a hunting spotlight, it pays to keep in mind a few general characteristics. First and foremost, the light needs to be durable and have a good runtime on a single charge of its batteries. The jostling and banging around that comes with hiking through trails and underbrush can easily make short work of a poor quality light. As well, unexpected rains or an impromptu drop into a steam can pretty well put the kibosh on any spotlight not up to facing a little water. To this end, look for a spotlight with lithium ion batteries and a waterproof housing made out of anything but cheap plastic. Lithium ion batteries are great for spotlights because they provide the power a strong lamp needs, while being able to hold a denser charge than other types of batteries. 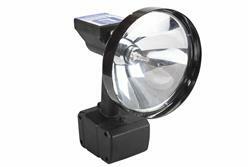 This translates into a stronger spotlight that will run longer during heavy use. Even better, lithium ion batteries generally do not require special charging practices and will last through a whole lot more charging cycles than other types. A good spotlight housing will be waterproof and made of good impact resistant nylon or nylon composites as well as aluminum or other lightweight metals. Out in the field, it just isn’t practical to try coddling equipment, and regardless of how careful you may be, mishaps are going to happen. Rather than take chances, assume the worst and look for a spotlight that is designed to withstand the abuse. Although there are a ton of options, the best spotlights come from the more reputable manufacturers. If you go with units that have some proven military/law enforcement use behind them, it’s even harder to go wrong. Larson Electronicss’ 15 Million Candle Power Rechargeable HID Pistol Grip Handheld Spotlight offers all these characteristics and more in a powerful unit that has the strength of real world testing behind it for example. The basic idea is, get a spotlight that can handle some abuse, will run for at least a couple hours, and has a beam that will project at least as far as your comfortable stalking range. By taking a little time and making a discerning choice, you’ll avoid the problems of finicky and fragile lights that last a season at best, and conk out in the middle of the hunt at worst.